The mystic symbol of the white rock has for its center of significance the personal relation of every man to his God. To him who offers unto God his own self as sacrifice, to him that overcometh, him who has brought his individual life back to its source, who knows that he is one of God’s children, he giveth the white stone. The name is one “which no man knoweth saving he that receiveth it.” He is to God a peculiar being, made after his own fashion and that of no one else; for when he is perfected he shall receive the new name which no one else can understand. Hence he can worship God as no man else can worship him, can understand God as no man else can understand him. God give me grace to be humble before thee, brother, and look up to thee for what revelation of God thou and no one else canst give. Each man lifts up a different humanity to the common Father. And for each God has a different response. With every man he has a secret—the secret of the new name. In every man there is a loneliness, an inner chamber of peculiar life into which God only can enter. I say not it is the innermost chamber, but a chamber into which no brother, no sister can come. From this it follows that there is a chamber in God himself into which none can enter but the one, the individual man, out of which chamber that man has to bring revelation and strength for his brethren. This is that for which he was made—to reveal the secret things of the Father. My late wife Teri and I came to Christ in large part thanks to George MacDonald. One of the first things we did together as Christians was somewhat playful; we went through every book of the Bible and read our birthday verses. Teri was born on February 17th, and it was her birthday verse from the very last book in the Bible that especially caught our attention. We weren't sure what the white stone and the new name meant, but the images and ideas resonated and stuck in our minds. 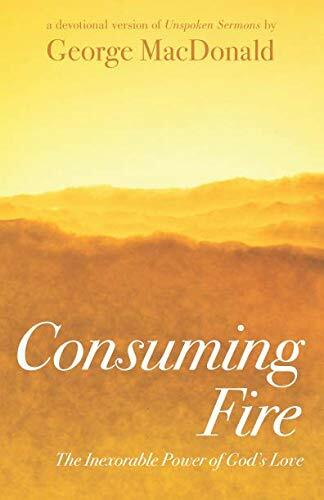 Teri was first to become captivated by MacDonald's Unspoken Sermons; she encouraged me to read it, but it was not until after she died that I immersed myself in the three volumes, and my subsequent passion for them and desire to make them more accessible to a broader audience led to the creation of Consuming Fire. In the February 9th entry, there's a footnote which MacDonald put into his sermon on Revelation 2:17, concerning the concept of mysticism. He notes that "the mystical mind perceives that the highest expression of which the truth admits lies in the symbolism of nature" and that "this is the highest mode of conveying the deepest truth," one often used by the Lord. Because MacDonald himself had a mystical mind, he was able to dive deep into the "mystic symbol of the White Rock" and bring back the precious pearls of its meaning. If the essence of living a life of faith in God is loving our neighbor, what better inspiration than to be told "God give me grace to be humble before thee, brother, and look up to thee for what revelation of God thou and no one else canst give"? Our destiny is to glorify God; what better than to know that we were made "to reveal the secret things of the Father?"